My name is Betty Tough. 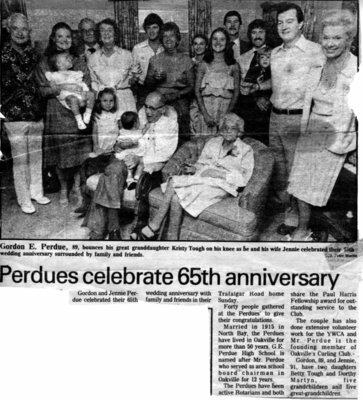 I was born in Oakville in 1922; my parents were Gordon and Jennie Perdue. At the instigation of my uncle John M. Wallace, who owned the Oakville Basket Co., my parents moved to Oakville from Kingston and my father, who had been a school teacher, became General Manager of the Oakville Basket company. When my aunt, Uncle John’s wife died, we moved in with my uncle and my mother ran the household. His home was a large estate on Lakeshore Rd. near Chartwell (at that time the 8th Line). My early memories are of walking to Brantwood School, crossing the open fields between Gloucester and Douglas Ave. and being terrified of the huge cows that were pastured there. When my parents bought a home on Watson Ave. near Lakeshore, Police Chief Kerr allowed me to duck through his fence and take a short cut to school. Miss Brown was the principal at Brantwood (this would be in the 1930‘s), a delightful, white-haired lady who taught Grade 1. I attended Old Central School located beside the radial bridge on Navy St. My parents gave me an old bicycle which I loved. I also had roller skates and a favourite pastime was to go skating on MacDonald Rd. There was nothing but strawberry farms - no Linbrook School or St. Lightbourne’s in those days. In the summer we picked strawberries for 2 cents a quart! The principal of Central School was R. F. Sanderson (we students nicknamed him Real Fat Sanderson), and he was! You got the strap if you misbehaved. There was a school nurse, Miss Jarvis, who checked each student regularly. Bill Hill had a grocery store on Lakeshore Rd. near Trafalgar (next to Dr. John Stead, our family doctor who had delivered me). For 5c you could buy a grab bag of candy: that was a real treat. I attended Oakville Trafalgar High School in the 1930‘s, just prior to World War II. They created a cadet corps for both boys and girls. I was a lieutenant of a platoon and recall marching round the football field barking commands and trying to sound officious. The Lorne Scots Rifles were active in Oakville and their big brass came to inspect us. I attended University of Toronto from ’39 to ’44. Because of the war, all the big football games between universities, McGill, Western, U. of T., were cancelled. Also, by 1942, students were required to participate in the war effort; I chose to do Nurses’ Aid. So many nurses had signed up with the WACS, hospitals were desperate. My assignment was the Princess Margaret Hospital in west Toronto. It took me an hour by streetcar from my university residence to reach it. I was instructed in how to make beds properly - to this day I mitre my corners. A head nurse had one practice on an orange with a hypodermic needle. And immediately I was giving injections to the patients! My brother, four years my senior, had joined the RCAF and was stationed at Trenton. He was sent to Bournemouth, England, rose to Flight-Lieutenant and was the pilot of a Lancaster bomber. On Christmas Eve 1944, he was shot down over Bonn, Germany. He and the navigator perished with the plane, the rest of the crew had time to bail out. Oakville was still a small town in those days, three to five thousand inhabitants. And when you walked down Main Street, you knew and greeted everyone. After completing a year at O.C.E. and receiving my Bachelor of Education, I married Douglas Tough, a metallurgical engineer who also graduated in ’44. We came to live in Oakville. A beautiful home stood at the top of the Red Hill on the west side of Trafalgar. The owner was Hughie Wilson who trained horses for the races at Woodbine. He owned all the property to the Lower Middle Rd. (now the Q.E.W.) and his horse stables were located where Oakville Place now stands. There was a little white stucco house near the stables where the groomsman lived. My uncle John bought this property in the early 40’s: he found it too damp living on Lakeshore near Lake Ontario. There was a large maple woods north of the house where we all went in March for the sugaring off: the trees were tapped and the syrup was a treat. I believe that woods is now part of Sheridan College. As children we loved to toboggan down the Red Hill and he welcomed all the children. When Doug and I came to Oakville to live we asked my uncle, J.M. Wallace if we might buy a piece of his property on which to build. Instead he suggested we rent the groomsman’s cottage. The Oakville Basket Co. had converted the horse stables into apartments, and I recall Vic Hadfield’s parents were one of our neighbours. I remember pushing the baby carriage with my first-born Jeanine down Trafalgar Rd. - then just two lanes - to Art Tuck’s General Store at Reynolds and Trafalgar. Soap and sugar were in short supply still (they’d been rationed during the war) and Mr. Tuck would slip me a little package of soap to launder my baby’s diapers. A thriving industry in Oakville in the 1920’s and 30’s was Glassco’s Jam Factory. It was located on the west side of Trafalgar Rd. adjacent to the railway overpass; it processed the strawberries grown on the farms in east Oakville. Mr. Glassco built a home just 5 minutes from his factory so he could go home for lunch: it was the first house to be built on Spruce St., a red brick dwelling built in 1922. My father purchased this house in 1940; it came with a play house in the back garden, built for Mr. Glassco’s daughter Eleanor. There was a laundry chute from the second floor to the first, and a milk cupboard with doors opening inside and out where the milkman left the milk. There were no supermarkets or malls in the 1940’s; my mother phoned in her grocery order each week to Mr. Harris’ store on Main St., and it was delivered that day. There was garbage collection. Mr. Duncan came once a week with his horse and wagon to collect the garbage. In 1948 my parents decided to build a home on Trafalgar Rd. on the river bank and Doug and I purchased the Glassco home, 340 Spruce St. from them. We lived there 59 years and raised our three children there. They all attended Brantwood School, as I had, and then New Central before Oakville-Trafalgar High School. It saddens me to think that Brantwood School is to be closed in 2010. Four of my grandchildren were pupils there too, and they feel as I do. The Lions and Rotary Clubs were very active in Oakville. My father was a Governor in the Rotary Club and latterly a Director of Rotary International. He travelled all over the world attending Rotary functions. Where the Oakville Curling Club now stands there was a skating rink and Victoria Hall. My husband supervised “Teen Town”, a meeting place for teenagers each Friday night in Victoria Hall. Hazel Caldwell, a local playwright, staged her plays at Victoria Hall. With the coming of Ford in the early 1950’s, Oakville changed from a sleepy small town to a bustling community. New stores opened on the Main St.(Lakeshore Rd.). The Oakville Curling Club was built; this had been the brainchild of Ed Barringham, Ned Farkley and my father. They worked feverishly to raise funds for its construction. Still very much interested in education, Gordon E. Perdue served as chairman of the Board of Education, first elected to the Board in 1942. He felt there was a need for a technical school in the community and a new High School was built on Maurice Drive; the new school was named in his honour. The school was later sold to the Catholic School Board for $1.00. It has since been torn down. During the War Years a large contingent of military personnel was stationed at Ortona Barracks on Bond St. off Kerr St. Baseball games at the Ball Park on Reynolds St. were popular. My uncle J.M. Wallace paid for lights to be installed for night games and the town honoured him by calling it Wallace Park. Before his death at age 95 my uncle offered his home to the town for the location of municipal buildings. The mayor, Al Masson, a staunch conservative, refused the offer and Town Hall was built across Trafalgar at its present location. J.M. Wallace was a strong Liberal supporter; politics raised its ugly head again! Wallace Pines, an apartment complex, now stands where his house once stood. Oakville was a pleasant community in which to raise a family in the 50‘s and 60‘s. On a windy day my husband would take the three children to fly kites on the hill just north of Oakville Trafalgar High School, located then on Reynolds St. This was one large vacant lot, and the Hospital stands there now. Our former hospital was an old home on First St. There was no maternity ward and I had travelled to Toronto to the Private Patients’ Pavilion to give birth to my three children. The Oakville Club, an athletic centre with badminton, tennis, yachting and swimming was a popular centre of activity. I had joined when I was just 13 years old and became an honorary member in 2000. Scottish dancing was popular, and for 6 weeks before Robbie Burns night we were taught the reels, the Strathspey, the Gay Gordons by Dr. Elliot Williamson, a Scottish doctor in town. Latterly our instructor was Gordon Fawcett, a pro on the dance floor. My children all participated in the activities at the Oakville Club. Some became quite proficient in their sports; my elder son won a tennis scholarship to University of Kentucky. After graduating, he returned to Canada to take his MBA at Western in London. My parents had taught me the importance of contributing to one’s community. I served on the Board of the Oakville Y.M.Y.W.C.A., of the Oakville Club where I introduced the Junior program in sports. I was an elder in my church, a Board member, an active member in the Oakville Hospital Auxiliary. While at St. John’s , with the help of Jean Guthrie and Florence Balderston, we initiated a program called “Outreach” to aid our missionary, Dr. Burgess, in Angola. Local craftsmen, artists like Alice Waywell, sold their art, and Outreach received a percentage. Outreach continued for some 25 years. I was a charter member of the University Women’s Club, organized by Jean Malcolm Smith. I was its first secretary and fifth president. The title of the Club now is CFUW (Can. Fed. of Univ. Women). As my children were growing up I did supply teaching for the Halton Board of Education. My first stint was at O.T. where Hugh Brearley, the Grade 13 physics teacher had come down with mumps, or was it measles. I worked late into the night preparing those lessons! 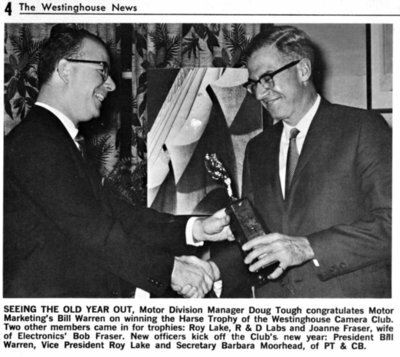 I was called to Blakelock, O.T., Perdue and White Oaks. The last ten years of my teaching career, I taught French, full time at White Oaks Secondary School. And now I have a daughter-in-law and two granddaughters teaching in Oakville schools for the Halton Board of Education.